Old Republic Risk Management introduced our simpliFORRMSM process in early 2015. 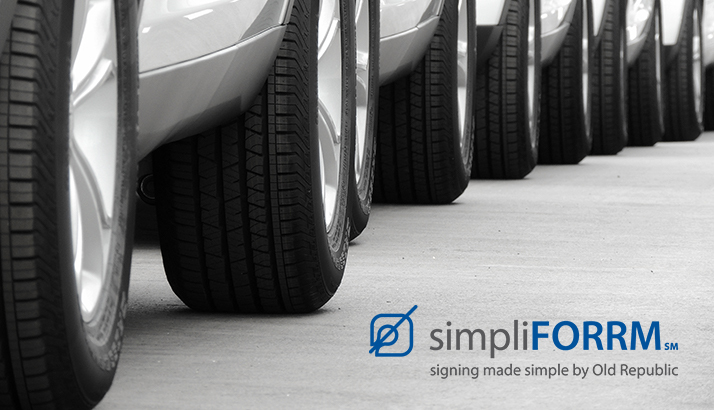 For those unfamiliar with it, simpliFORRM is our electronic DocuSign-based platform developed for clients who purchase Commercial Auto Liability Insurance. simpliFORRM is an automated process available to our Insureds to make coverage selections for Uninsured and Underinsured Motorists Coverage; Personal Injury Protection/No Fault Coverages; and Medical Payments in all 50 states – plus the District of Columbia and Puerto Rico. We send an Electronic Document Delivery Agreement to the Insured for their signature. We send a Survey though DocuSign through which we obtain the Insured’s responses to a set of questions related to their coverage election options. Based on the Insured’s responses to our Survey, we prepare a Coverage Election Manual with the available coverages. That Coverage Election Manual is then sent to the Insured, again via DocuSign, for their review and electronic signatures. Upon completion, all the final signed documents are housed in DocuSign from which users may obtain a PDF copy for their records. From an operations perspective, simpliFORRM has led to some significant improvements in our workflow. Prior to implementing simpliFORRM, our Coverage Election Manual consisted of a hard copy binder that we would send out to each Insured – for each Auto Liability policy – prior to each renewal. Each selection/rejection document would be manually completed by the Insured and signed with a wet signature. The completed Coverage Election Manual would then either be scanned and emailed back to us, or returned as a hard copy through the mail. simpliFORRM’s electronic documents and communications have replaced this complex paper-intensive process. With simpliFORRM, we have seen a significant reduction in the back and forth questions and interaction with our Insureds leading to the final completion of coverage election forms. This process was time consuming for our team as well as our Insureds. We appreciate that our Insureds have limited amounts of time to spend on completing their coverage elections. However, we also know they want to be confident that their policies reflect their intended coverage choices. simpliFORRM provides that additional layer of certainty. For Insureds who use simpliFORRM, Old Republic has reduced the lead time to issue policies by more than 50%, primarily because of the improved efficiency at which we are able to obtain final completed and signed Coverage Election Manuals. While we are pleased with our internal process improvements, we are especially proud of the feedback we’ve received from our Insureds expressing satisfaction with simpliFORRM. If you have not experienced the improved simpliFORRM process, please contact your broker or an Old Republic Risk Management Account Executive for more information. To gain greater control over your casualty program, let ORRM develop a customized solution to your risk management needs.